Well friends, we are back from our break and working with no end in sight, trying to provide you with as much entertainment as we can. To start it off, here is podcast 80! 2008 was awesome, but if this podcast is any indication of how 2009 is going to go, you might as well pretend last year never happened. In this podcast, we discuss and analyze the cinematic journey of the movie-film "Minghags." We also give the best and worst of 2008. Okay, it's time to watch this son of a gun. 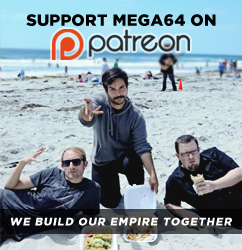 Go gather the kids and get a big bowl of popcorn ready and let's have some family time, Mega64 style. Click here for the audio version!